A commercial sewage treatment plant is a large-scale sewage treatment plant capable of dealing with wastewater and sewage generated from commercial developments such as hotels, schools. Caravan parks and other developments. The following article discusses what you should know about large commercial septic systems. When do you need a commercial septic system? A commercial septic system or commercial sewage treatment plant is generally needed where there is no public main sewer available for a development. In situations like this, a commercial septic system is the only method of treating the sewage and wastewater generated on-site. A commercial sewage treatment plant may also be installed in a situation where there is a public main sewer accessible to a development site, nut where the existing sewer does not have the capacity to deal with the sewage and wastewater that will be generated from the new development. How does a commercial septic system work? A commercial sewage treatment plant or septic system operates in a similar fashion to a smaller domestic system. Heavy solids are removed via the use of primary settlement tanks, or by a mechanical screen. This partially treated wastewater then undergoes natural biological treatment in an aeration chamber. With many large-scale sewage treatment systems or large scale septic systems, the standard of treatment needed can often be higher than normal. This is because larger volumes of effluent entering groundwater or surface water can have a bigger impact on water quality. It is therefore common to incorporate a chemical dosing system to reduce phosphorous, an anoxic stage for nitrogen reduction or ultraviolet treatment to remove bacteria and pathogens from the wastewater. All Biocell commercial septic systems have these optional modules available to achieve any required effluent standard. How much does a commercial septic system cost? A commercial sewage treatment plant or septic system can vary greatly with regard to cost. Factors that have an impact on cost include the size of the sewage treatment plants, the effluent standard that needs to be achieved and the ground conditions which may determine the installation costs. Installing a commercial sewage treatment plant is the first step to managing wastewater from a development. But like any piece of equipment, maintenance and operation costs must also be considered. It is very important to complete regular maintenance of your system to ensure correct operation of the commercial septic system and to prevent excess wear and tear on parts. Some commercial septic systems user submerged aerators and have a variety of mechanical parts. However, modern commercial septic systems have very few working parts and have no moving parts within the sewage. Maintenance costs on these modern systems are therefore minimal. Whether you are buying a commercial sewage treatment system for a hotel, a commercial sewage treatment system for a school, a commercial sewage treatment system for a caravan park, or a commercial septic system for any other development, there are several things you should check. A commercial septic system is an integral part of any infrastructure onsite and as such, it needs to last as long at the buildings and other elements of the development. 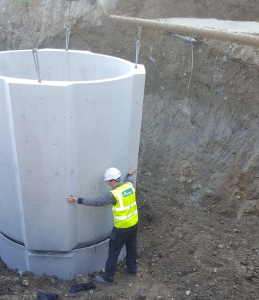 Tank warranty – concrete tanks offer a superior solution for larger projects. A concrete system will have a 40yr tank warranty. Whereas a plastic system will have a 10-15-year warranty. So, unless you want to replace tank after 15 years, go for a concrete commercial septic system. Process – Many companies only offer one type of treatment process. However, different types of systems are more suitable for different developments. As an example, a school has no sewage entering the plant in the evenings or weekends. So, an SBR type system is the best choice. In contrast, a motorway service station has large volumes of high strength sewage entering the plant all day, so a moving bed plant with the capacity for higher levels of biological treatment many be preferred. Buy direct – it is always better to buy directly from the manufacturer of the system, not an agent.